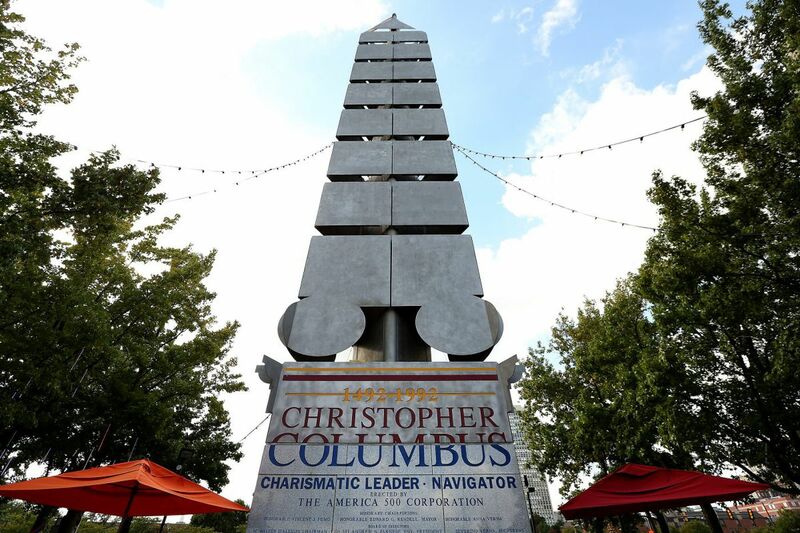 This South Philly monument to Christopher Columbus: just another example of how we revere him. The most confounding statement I've heard in some time, not counting any of the president's tweets, came from the organizer for Philadelphia's annual Columbus Day parade, Jody Della Barba. She told CBS3 this month that those who are opposed to a holiday honoring Christopher Columbus are trying to "rewrite history." Hearing fellow Philadelphians deploy this defense makes my teeth hurt. Because, guess who makes the same argument? Neo-Confederates — people who defend monuments that enshrine a war waged to eternally codify slavery and obliterate the United States. Like Della Barba and Marco Circelli, the Filitalia Museum director who said Philly needs Columbus Day so it can "learn from history," Confederate flag-wavers yammer on about how Americans who want to tear down statues of Robert E. Lee are "rewriting history." The truth is that the defenders of Columbus Day and Confederate statues are the ones committed to rewriting history. They're choosing to look at the readily available, vicious truth about Columbus — agreed upon by virtually all historians of note — and say that it can be reduced to "he got here first and then America happened." Monuments and holidays celebrating Columbus extol the Schoolhouse Rock edition of a conqueror and killer. The iteration of Columbus we give a federal holiday to is born out of antiquated textbooks and bad junior high social studies classes. The version we appreciate annually is a pious and somewhat unwitting arbiter of a new age who tamed a continent and primed the earth for Western civilization. This version is an adventurer, and, in the twisted personal beliefs of many, the kindly progenitor of the American race. This version of Columbus never existed. Columbus was a murderer and a zealot, responsible for the depletion and destruction of entire societies. The real Columbus enslaved and obliterated the Arawak and Taino peoples, and, according to many accounts, was responsible for the creation of the American slave trade. The sins of Columbus are innumerable; historians will never be able to put to words how brutal his conquering of Central America was. There is no mitigating factor for Columbus. He was a conqueror, and he represents everything that Americans are supposed to have left behind them, like wan imperialism, racial subjugation, extreme religious cruelty, and forced evangelizing. The real Columbus doesn't deserve a federal holiday because he was a brutal emissary of a shamelessly expansive empire that used religion as a justification for its wanton evil. And yet, somehow, the main talking point by those who want Columbus Day to continue is that to do away with it … is to rewrite history. Having a holiday dedicated to Columbus solely based on his actions as a navigator is like having a holiday devoted to Mao Zedong solely based on his stellar record as a teacher. It requires an intentional ignorance of history — and it mandates the same dishonesty that allows people to view Jefferson Davis as a hero. We should consider renaming Columbus Day "Indigenous People's Day," as Los Angeles recently did (although there has to be a catchier name). Because unfortunately, history needs to be un-rewritten. The record needs to be corrected, and the story of the denigration and decimation of Native Americans needs to be appreciated and given the day of shivah it deserves. In order to truly appreciate the impact of Columbus, we have to stop perpetuating his hero myth — just as if we want to truly learn from Civil War, we have to stop praising its leading terrorists. As that stupidly gauche conservative saying goes, "Facts don't care about your feelings." Quinn O'Callaghan is a journalist and staff writer for the Philadelphia Citizen. His books are represented by Dystel, Goderich & Bourret.